The year 2012 was a year like none other for NASA, one dominated not by human spaceflight activities but by redefinition. That redefinition saw the prominent rise of unmanned planetary exploration both for NASA and the general public. And nothing was as meaningful or as widely watched in 2012 for NASA as what happened on the morning of 6 August 2012: the landing of Curiosity, the Mars Science Laboratory, on Mars. 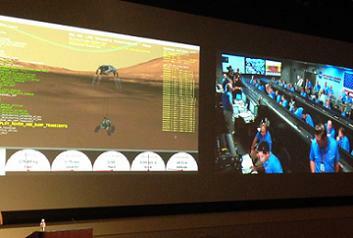 In a year when desperately NASA needed a glorious public relations event to boost its recognition with the general public, nothing could have been asked for more than the highly successful and jubilant landing of the Mars Science Laboratory rover Curiosity on the surface of Mars on the morning of 6 August 2012. Dubbed the seven minutes of terror, Curiosity’s entry into the Martian atmosphere was one of engineering brilliance, executed by a pre-programmed series of computer commands encoded by scientists and engineers months earlier to steer Curiosity to the most precise, pinpoint landing of any robot on the surface of any non-Earth planet in history. Joining the night of hair-raising suspense for Curiosity’s control team – and those who had intimately followed the mission for years – was a wide audience from the general public who tuned in to NASA TV, live internet streams. Even New York City’s Times Square jumbo television – in front of which, at 1:30 in the morning, gathered a crowd of at least 1,000 people. Curiosity’s landing on the surface of Mars was the most-watched and talked about endeavor for NASA in 2012 – and brought NASA’s success rate at Mars to 14 for 20 (a 70 percent success rate) and 4 for 4 in their attempts to land a rover on Mars (a stunning 100 percent success rate). Following an Entry, Descent, and Landing sequence that employed several new and never-before-used planetary landing techniques – including the use of a sky crane to winch Curiosity gently onto the Martian surface – Curiosity touched down on the surface of Mars on the Aeolis Palus in Gale Crater. Landing was confirmed to be just 1.5 miles from the center of the targeted touchdown location – a record-close (near-perfect) landing precision percentage following a 350 million mile journey from Earth to Mars. Following landing, as has been the tradition with the three previous Martian rovers (Carl Sagan Memorial Station for Sojourner, Columbia Memorial Station for Spirit, and Challenger Memorial Station for Opportunity), Curiosity’s landing site was named in honor of a recently passed pillar of science, or in this case, science-fiction: Ray Bradbury (Bradbury Landing). Tasked with investigating the Martian climate and geology, assessing whether the selected field site inside Gale Crater has ever offered environmental conditions favorable for microbial life, and conducting planetary habitability studies in preparation for future human exploration, Curiosity’s control team took several weeks to verify the rover’s systems post landing. 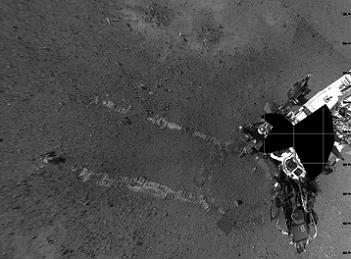 After a two weeks of ground testing, Curiosity and its systems were put to the test for the first time on 19 August when the rover used its Chemistry and Camera (ChemCam) instrument to laser zap a rock, nicknamed “Coronation,” located near the rover’s landing site. During the test, Curiosity’s ChemCam instrument hit “Coronation” rock with 30 pulses of its laser during a 10 second period. Each pulse delivered more than three million watts of power for about five one-billionths of a second. The energy from the lasers excited atoms in the rock into an ionized, glowing plasma, which was recorded with a telescope and analyzed with three spectrometers for information about what elements were present inside the rock. The initial use of the laser on Mars served as target practice for characterizing the Chem/Cam instrument while also providing additional value to researchers on whether the elemental composition changed as the laser pulses progressed. By 20 August, Curiosity had extended its robot arm for the first time and used its navigational cameras to capture a view of its extended arm. The first atmospheric pressure readings from Curiosity, collected from 15 August through 18 August, were returned to Earth later that same week for analysis. During this same time period, Curiosity pummeled the ground of Mars with neutrons via a process called active neutron sounding. The experiment, called the Dynamic Albedo of Neutrons, or DAN, measured the amount of hydrogen, an indicator of water, in the soil by observing the degree to which the neutrons were scattered. 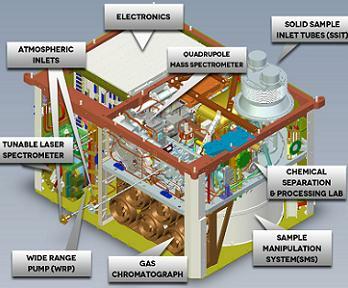 The test provided data regarding the content of near-surface water at Curiosity’s landing site and demonstrated that the DAN instrument was in perfect shape during the first use of the neutron sounding technique for interplanetary exploration. DAN will be an important instrument for Curiosity throughout its mission as the rover will use this experiment to gather data on the variations of neutron profiles at various locations – variations that would indicate changes in the water content of the soil down to about 3.3 feet, or 1 meter, below the surface. As was the case during its landing, Curiosity returned these initial science data results and information regarding on its own self-performance evaluations to Earth via a communication relay with the Mars-orbiting-spacecrafts Odyssey, Mars Reconnaissance Orbiter, and Mars Express. In turn, those satellites then relayed the signals through the Deep Space Network and then on to the Mars Science Laboratory mission operations room. Finally, on 22 August, after nearly two weeks on the surface, Curiosity took its first “steps” on the Red Planet during a successful test drive that covered 15 feet, or 4.5 meters. The test involved rotating the rover 120 degrees and then reversing by eight (8) feet to test the rover’s ability to turn around and back up (i.e. navigate around potential ground hazards). After a quick rove to an area of exposed bedrock, Curiosity spent the first couple days after its second drive exploring the area of bedrock that was exposed by the thrusters from the rover’s descent stage on 6 August. 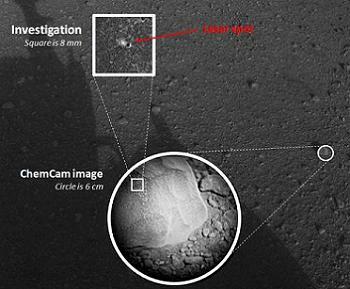 After using its lasers and ChemCam experiment on 25 August to examine side-by-side points in a target patch of soil in Gale Crater, Curiosity began its drive to its first official target location in Gail Crater – Glenelg. On 2 September, the 27th day of Martian operations, Curiosity snapped a photo of a rock outcropping called Link, an outcropping that penetrated from a Martian surface that was elsewhere blanketed by the reddish-brown dust common on the surface of the Red Planet. The fractured Link outcrop was subsequently found to have blocks of exposed, clean surfaces and rounded gravel fragments or clasts measuring up to a couple inches in size. These clasts showed evidence of erosion by a flowing liquid, and the Link characteristics were found to be consistent with sedimentary conglomerate, or a rock that was formed by the deposition of water and composed of many smaller rounded rocks cemented together. 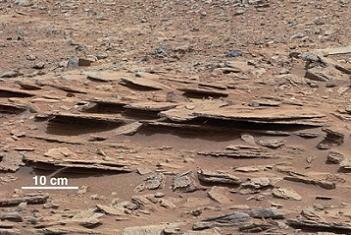 Water transport, according to NASA, is the only process capable of producing the rounded shapes of clasts of this size. Following on the heels of this discovery, Curiosity was in perfect position on 13 September to observe the transit of Phobos, one of Mars’s two moons, across the surface of the sun. During the transit event, Curiosity’s mast camera was used to take high-definition video frames at about three frames per second for more than two minutes as Phobos crossed the disc of the sun. The Curiosity rover’s Environmental Monitoring Station instrument also observed the transit, noting a five (5) percent drop in the sun’s ultraviolet radiation reaching the surface of Mars during the event. Martian scientists stated they would use the Phobos transit data from Curiosity to continue to refine and precisely determine the orbital characteristics of the Martian moon. The very next day, on 14 September, Curiosity found evidence of an ancient, flowing stream on Mars at several sites around its location – sites that bore striking similarity to the Link location photographed earlier in the month. By 19 September, Curiosity was closing in on the Glenelg area of Gale Crater, an area where three different terrain types come together. 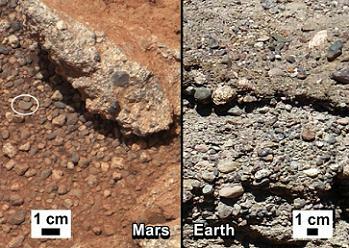 All three terrain types had previously been observed from orbit by the Mars Reconnaissance Orbiter. Of particular interest in these types of terrains was a light-toned and well-developed layering which likely recorded the deposition of sedimentary materials millions of years ago. Following this, the next major milestone for Curiosity came on 22 September, the 46th day of Martian operations, when the rover extended its navigation camera on the right-hand arm and touched its first rock on Mars. 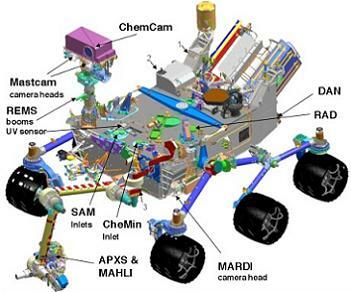 The navigation camera, equipped with the Alpha Particle X-ray Spectrometer instrument, allowed Curiosity to assess the chemical elements present in the rock. 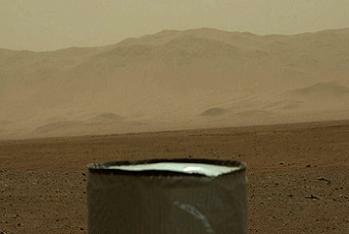 Following this, on 7 October, Curiosity used its scoop to take its first sampling of Martian dirt. Ten days later, Curiosity had its first x-ray view of the Martian surface, acquired by directing an x-ray beam at a sample of soil and recording how the x-rays were scattered at the atomic level by the sample. 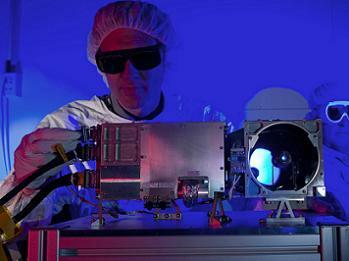 By doing this, the instrument was able to identify and quantify minerals on Mars for the first time. Each mineral had a unique pattern of rings, or fingerprints, revealing its presence. 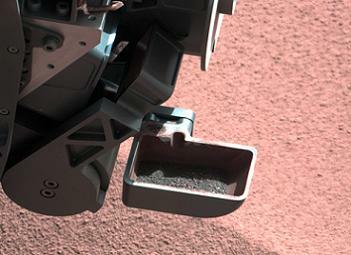 By 3 December, the first results from the grains of sand scooped up by the rover were in. 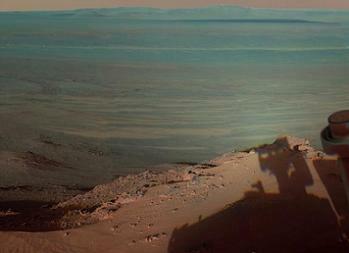 Scientists, using the instruments onboard Curiosity, detected sulfur, chlorine, and oxygen compounds. Scientists indicated that the oxygen and chlorine may come from perchlorates or similar compounds which contain chlorine and oxygen. Also revealed on 3 December was information regarding Martian atmospheric loss as determined by SAM (Sample Analysis at Mars) measurements of the deuterium/hydrogen ratio in the water in the soil. Deuterium, a heavier version of the hydrogen atom, allows scientists to look at the deuterium to hydrogen ratios (or D/H levels) along with isotopes of other elements to study how Mars’s atmosphere has changed over time. Mars, which has less gravity than Earth and lacks a strong enough magnetic field to shield its atmosphere from the sun, is slowly losing its atmosphere. As this process occurs, the lighter hydrogen atoms are preferentially lost compared to the heavier deuterium ones. SAM successfully measured the D/H ratios in water released upon heating sand samples. The results showed that the water vapor consisted of more deuterium than that of Earth’s water. This was expected since the lighter hydrogen atoms in the Martian atmosphere are escaping faster than the heavier ones. Moreover, Curiosity also returned results during its first four months of operation on Mars’s thermal tides – a weather phenomenon responsible for large, daily variations in pressure at the Martian surface. During this thermal tide process, sunlight heats the surface and atmosphere on the day side of the planet, causing air to expand upwards. At higher levels in the atmosphere, this bulge of air then expands outward, to the sides, in order to equalize the pressure around it. Air then flows out of the bulge, lowering the pressure of air felt at the surface below the bulge. The result is a deeper atmosphere, one that is less dense and has a lower pressure at the surface than that on the night side of the planet. 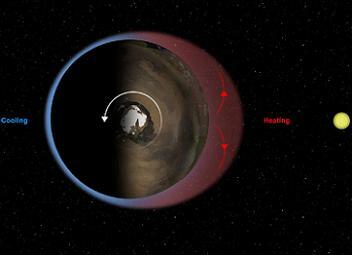 As Mars rotates beneath the sun, this bulge moves across the planet each day. Curiosity was able to measure a decrease in pressure during the day, followed by an increase in pressure at night. And thus the journey of Curiosity began! 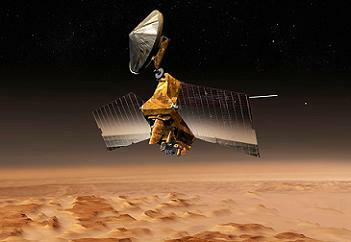 By its 130th Martian day, Curiosity had driven over 450 linear meters (linear distance, not actual meters driven by the rover) from its primary landing site at Bradbury Landing to a point called Yellowknife Bay where it will continue its constant, non-seasonal effected scientific observations of Gale Crater and the area surrounding Mount Sharp. While most eyes were focused on Curiosity from August to December, Curiosity was, in actuality, not the only rover making history on the surface of the Red Planet this year. 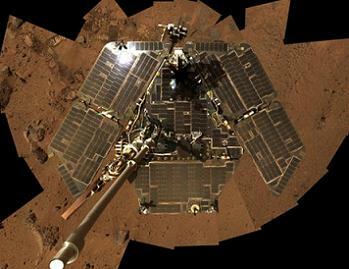 The Opportunity rover, celebrating its 8th full year of operation, a feat in and of itself as the rover’s primary mission was only supposed to last 90 days, continued its fruitful search and exploration of the Red Planet in 2012. Beginning the year at the rim of Endeavor Crater, the rover spent the first few months of the year at a site informally named Greeley Haven. The name, a tribute to planetary geologist Ronald Greeley who passed away in 2011, signified a place around Endeavor Crater within an outcropping (named Cape York) that provided a sun-facing slope to aid in maintaining adequate solar power during Opportunity’s record-breaking fifth Martian winter while at the same time still providing adequate targets of scientific interest for the rover. The need to find a sun-facing slope for Opportunity to spend the winter had never been an issue before as Opportunity was closer to the equator than its twin rover Spirit was during Spirit’s time of operation on Mars. However, Opportunity’s solar panels now carry a thicker coating of dust than in previous winters, thus necessitating the need for Opportunity to find the sun-facing slope for the winter. Throughout its winter hiatus, Opportunity maintained an approximate 15 degree tilt to keep its solar panels favorably aligned toward the winter sun that was low in the northern sky. For its winter worksite, Opportunity was tasked with radio science investigation of the interior of Mars, inspections of mineral compositions and textures on the outcropping of Endeavor Crater, and recording a full-circle, color panorama of Greeley Haven. In all, Opportunity spent 19 weeks at Greeley Haven investigating dozens of targets within reach of its robot arm. As with all four winters before, Opportunity came through its fifth Martian winter in as near to perfect condition as possible for an eight-year-old rover. Taking its first drive in nearly six months, Opportunity moved further north on the Cape York area of Endeavor Crater on 8 May to bring itself closer to a bright-looking patch of what rover scientists hoped was dust. 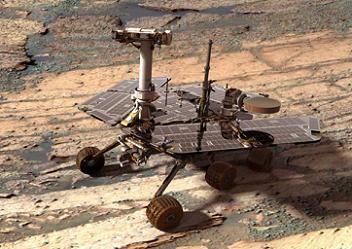 By 4 December, Opportunity had completed one full walkabout circuit of Endeavor Crater – a process that began with rover’s arrival at the crater many months earlier. Now, as the rover approaches its ninth anniversary on the Red Planet next month, Opportunity will conduct a more detailed exploration of Endeavor Crater, an area where Mars orbiting spacecraft have detected traces of clay minerals which form under wet, nonacidic conditions that can be favorable for life. The precise area for exploration is named Matijevic Hill, in honor of the late Jacob Matijevic who led the engineering team for the twin Mars rovers Spirit and Opportunity, and is located on the western rim of Endeavor Crater. Barring any unforeseen circumstances, Opportunity will mark its ninth operational anniversary on the surface of Mars on 24 January 2013, continuing its service as the longest-lasting robot (and rover) on the surface of another planet as it continues to collect information that will be used to safe-guard the first Humans who will visit Mars later this century. Check back on December 27 for Part II of NASASpaceflight.com’s Year In Review series – the unmanned planetary probes: MESSENGER, GRAIL, Cassini, the Voyagers, and Kepler.